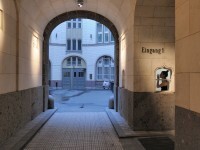 “SOLO” was premiered in November 2009 at the exhibition space LOGE (a 4 square-meter former porter’s office) in Berlin. It featured the soprano Ruth Rosenfeld performing a situation with music and text composed for the space by Ari Benjamin Meyers. In “SOLO” only one audience member at a time is able to enter a small room and experience a 6-minute live performance by an opera singer. The composition echoes and explores the charged atmosphere provoked by the confined space and one-to-one relationship. After the singer exits, the audience member is invited to stay alone in the room as long as he or she would like before leaving. After a short pause, a new audience member is admitted and the performance begins anew. “SOLO” creates a personal and intimate listening situation and transforms a very small space into a very small private concert hall. The space itself and the performance therein additionally take on the character of an installation, since the work can also be (partially) seen and (over-)heard from the outside. “SOLO” requires a closed-off or completely enclosed small space, preferably not a cube but a room with edges, stairs, corners, etc. and one which offers a view, however obstructed, through one or more windows, doors, or openings to an “outside” area.